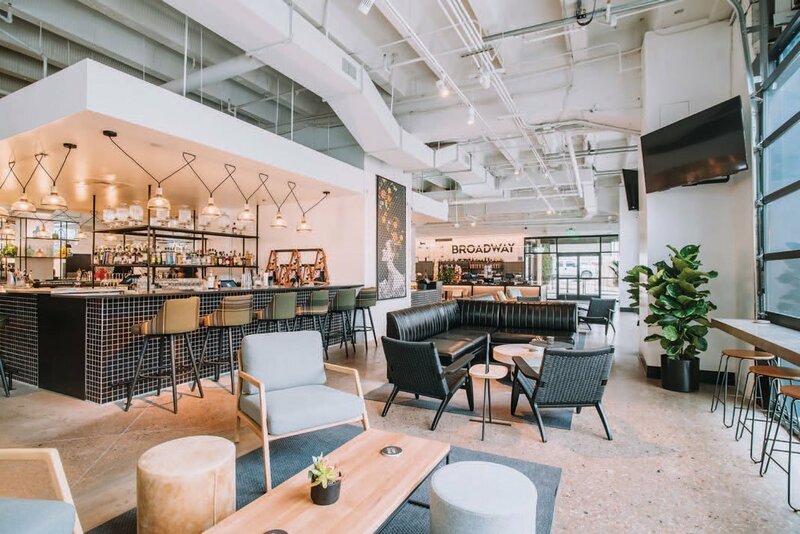 Broadway Market, in the old Tony’s space on the Golden Triangle-Capitol Hill cusp, is the 12th food hall to open in the Denver area, which says a lot about our region’s preferred dining style. 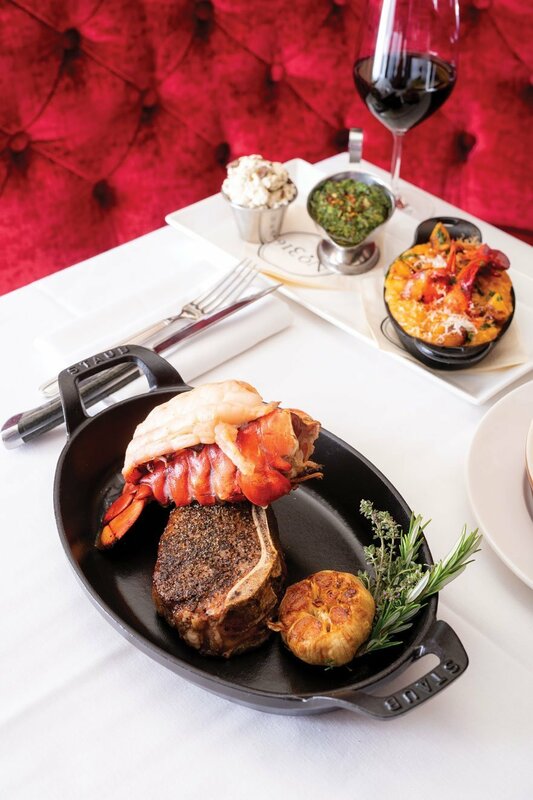 One might describe it as the antithesis of fine dining, except that, even in a casual setting, we want our food to be oh-so-fine. We gave it go on a Wednesday evening, after we were told that lunch was busy but dinner was “a bit more vibrant and rowdy.” Rowdy? 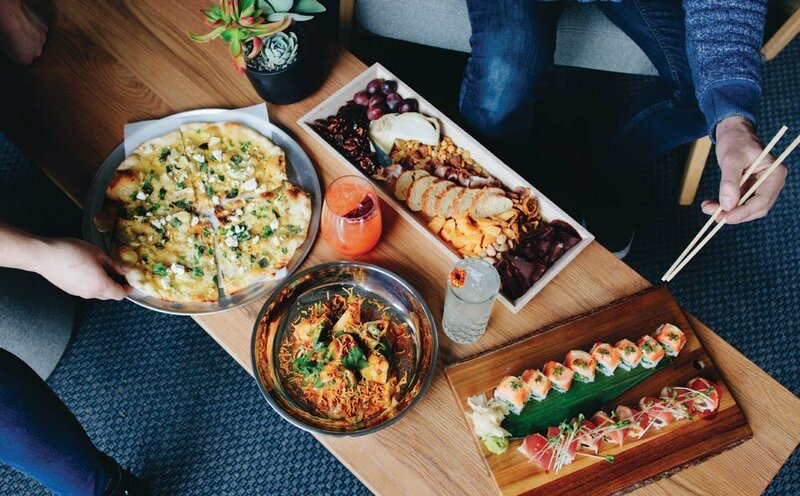 Now there’s a rare compliment for a new dining establishment, even one with nine food stops, from pizza to empanadas to sushi. But the convivial spirit of the place quickly emerged as we made our first stop—the beer wall—and giggled and chatted with other patrons over the high-tech system and selection of 24 self-pours. In hand was our tiny fob, doubling as our meal ticket. 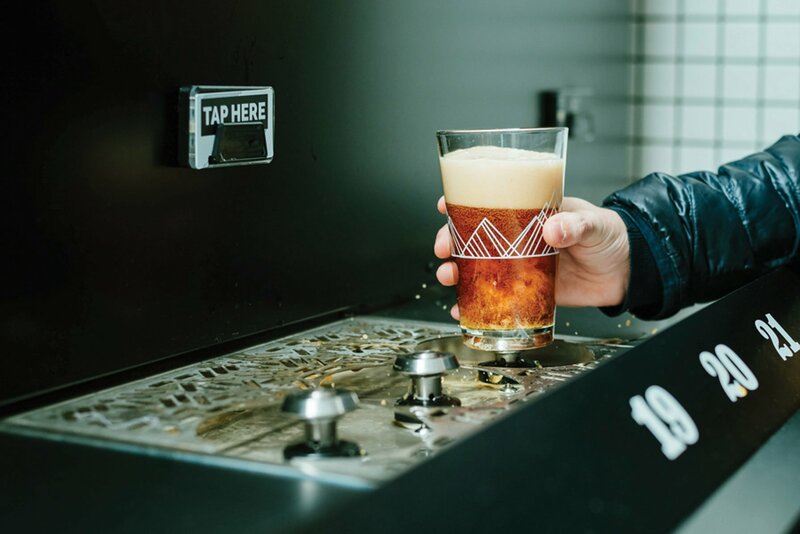 A new concept in Denver, the Broadway Market fob is linked at check-in to your credit card, allowing you to wave it at the beer wall sensor and use it at any of the nine dining stands. We shared, but, if you’re meeting eight friends, you can each get your own and thus be relieved of higher math and check wrangling. You can still buy and tip in cash, if you choose, or add on a tip at the end that will be divided based on where the money went that night. My husband headed straight for Biju’s Little Curry Shop, where he opted for the Daily Special Curry, tender and perfectly cooked grilled steak sauced in the house X-Hot Vindaloo ($12.95). With jalapeños, red onion, and greens alongside white rice, the colorful dish pleased his palate. He also ordered the chili lime tater tots ($3.50), addictive fried morsels that are a must-have side or appetizer no matter your choice of mains. I scored on my entrée, the Lamb Doner Bowl from Mother Tongue ($11.50). 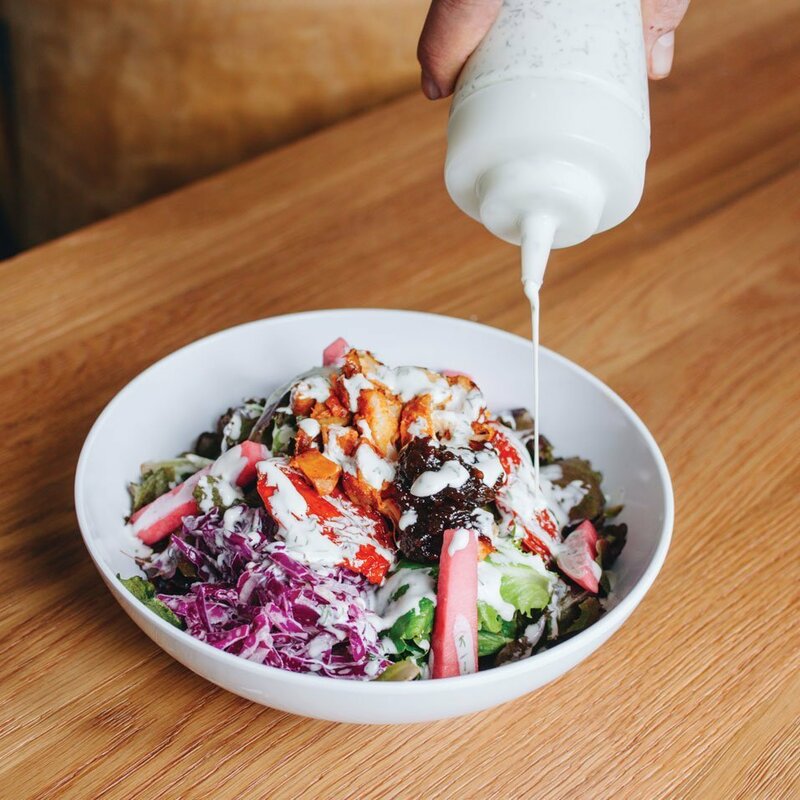 A large mound of lovingly coddled and roasted Colorado lamb served on organic mixed greens was flavored with cucumber-dill yogurt, harissa aioli, roasted tomatoes, onion jam, cured vegetables, and tahini slaw. While I swooned and sipped my Ottoman Emperor cocktail ($10), the hubby got us a to-go French Rooster ($12) from Royal Rooster—fried thigh and house-made ham on a sandwich so good it almost didn’t make it home. The Sea Salt Chocolate Chip Cookie from Miette et Chocolate sealed the deal. If the word “steakhouse” conjures unwelcome ideas of traditionalism, you should try the Bone Marrow Luge at the new Steakhouse No. 316 in Boulder. On a recent evening, the dish came out unexpectedly, with a grinning explanation from our waiter. The bone luge, like the ice luge, is a means of imbibing liquor. Rather than a channel of ice, the booze runs through the cavity of a beef bone, picking up salt and marrow on its way. When the waiter tipped the bone to my lips and poured a shot of top-shelf whiskey down it, any notion of the place as stuffy evaporated on the spot. • 1922 13th St., Boulder.